A reliable source for Static Eliminators information and a resource for accessing leading Static Eliminators and suppliers. Static eliminators are products that protect susceptible items from the effects of static discharge. These static shields are also known as antistatic (anti-static) devices, anti-static electricity devices, or static charge eliminators. They work by dampening, reducing, or otherwise inhibiting its buildup or discharge. Static Eliminators Static eliminators are products that protect susceptible items from the effects of static discharge. These static shields are also known as antistatic (anti-static) devices, anti-static electricity devices, or static charge eliminators. They work by dampening, reducing, or otherwise inhibiting its buildup or discharge. 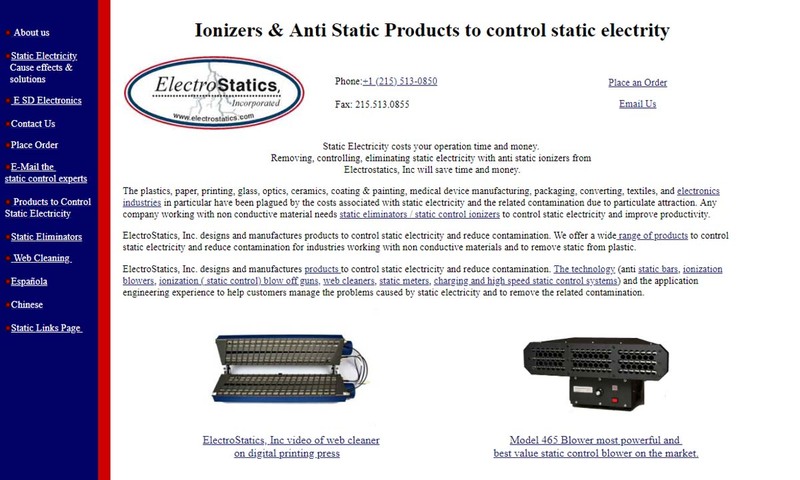 ElectroStatics, Inc. offers static control equipment and contamination controls. Ionization equipment, instrumentation for static measuring and testing, static bars, power supplies, converting accessories and more. Gordon’s ESD & cleanroom products meet the specific needs of the electronics industry plus industries where static electricity buildup is detrimental to manufacturing. 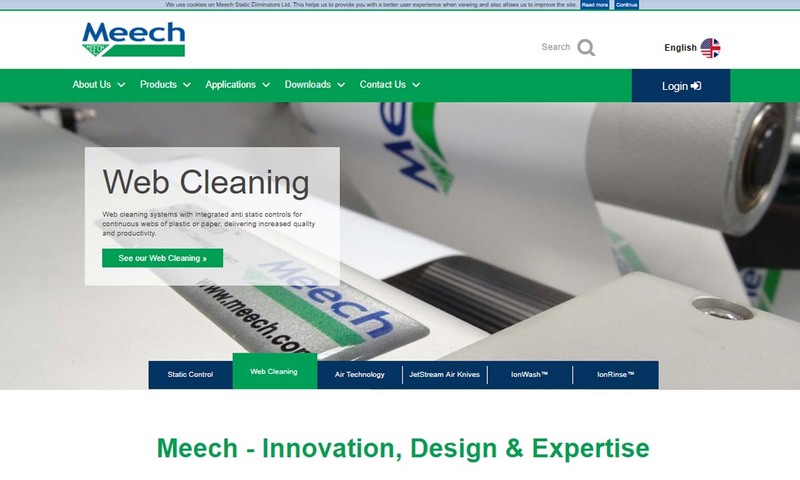 Meech pioneered the industrial use of Pulsed DC technology for static control & has over 4,500 systems in use in the plastics, converting, printing & packaging industries. 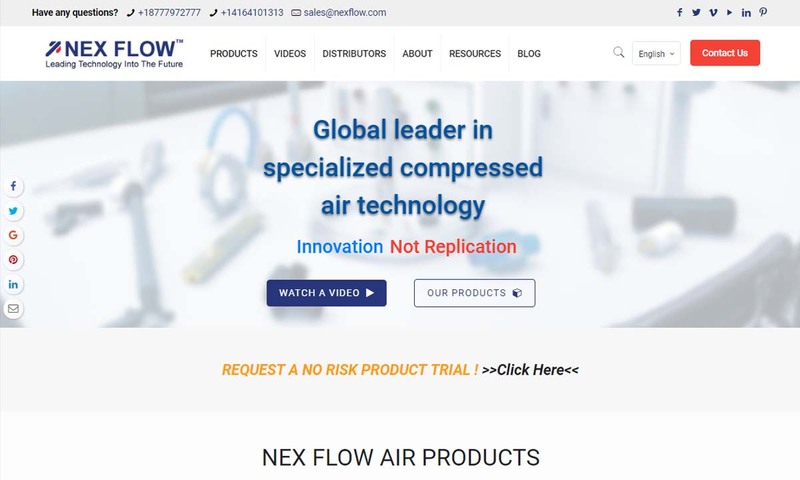 Nex Flow’s line of air moving, air amplification, air conveying & air cooling products also includes static control technology. Our powerful, high quality static eliminators are used to control dust and charges on plastics and virtually any application where static charge is a problem. 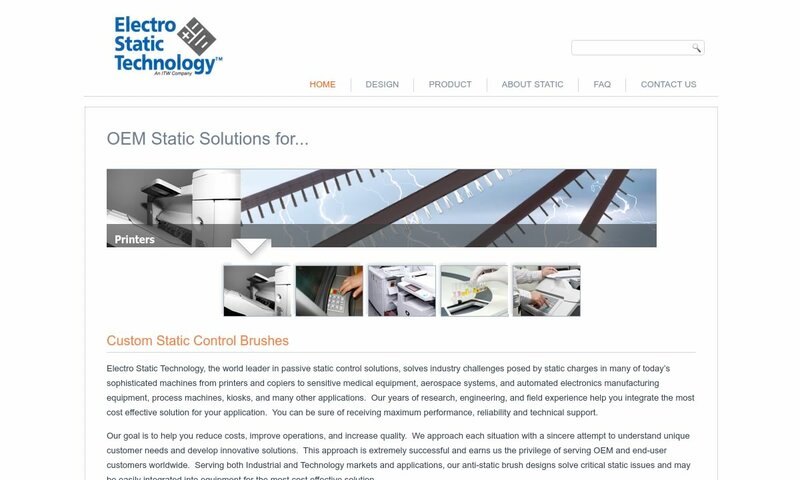 Electro Static Technology™ designs and manufactures custom OEM configured static dissipative brushes for a broad range of applications such as printers, copiers, graphic arts and packaging equipment. Static discharge is a term that refers to electricity at rest that produces excess cations (positive ions (positively charged ions)) or anions (negative ions (negatively charged ions)) when the molecular structure of an insulating material like plastic or paper becomes unbalanced. Most often, this imbalance is created through separation, changes in temperature, and friction. A disproportionate number of ions can create a number of problems, such as the risk of equipment damage, minor electrical shocks to workers, and fires. Static eliminators reduce or eliminate these risks. Static electricity can impact products in a wide variety of industries, such as automotive, electronics, medicine, plastics processing, printing, power generation and power supply, semiconductor processes, and residential services. Static eliminators help stop static problems in all of these industries. 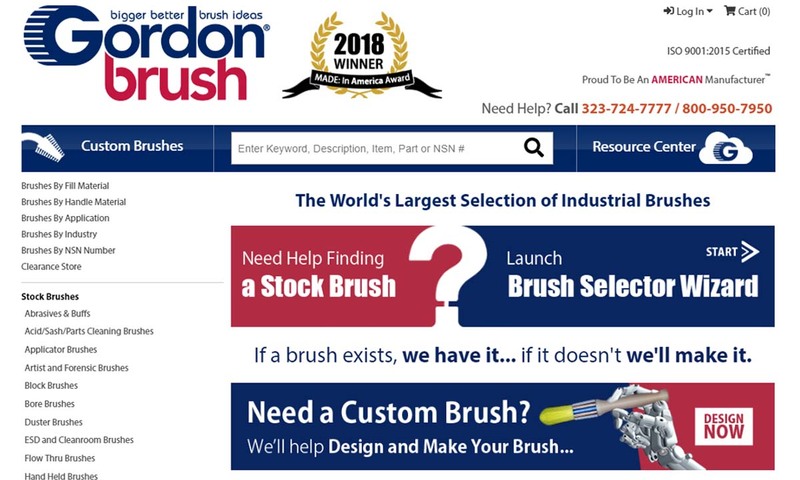 Static Eliminator – Gordon Brush Mfg. Co., Inc. Without fully grasping it, humans have had knowledge of static electricity since around the 7th century BC. In approximately 600 BC, Thales of Miletus, a Greek scientist, wrote about it when he described his observation that you can use a piece of amber to pick up dust and leaves if you first rub that piece of amber. Today, we recognize the reason this works is because by rubbing the amber, you cause friction, which can facilitate static electricity. Later, Theophrastus, another Greek thinker and a student of Aristotle, detailed this same phenomenon (how some stones, like amber, can attract other items), in his work On Stones. Jumping forward hundreds of years, the first person to talk about static electricity outside of the context of friction was William Gilbert. In 1600, this British scientist discovered the difference between electricity and magnetism. Previously, scientists were under the impression that these two phenomena were the same thing, when actually, magnetism is a result of the movement of electricity. Gilbert named electricity electricus, a New Latin term for “of amber” or “like amber” harkening back to Thales of Miletus’ description of the friction caused by rubbing amber. This term moved into the English language permanently as “electric” and “electricity” by 1646. After this, scientists around the world started studying electricity more closely. Famously, Benjamin Franklin proved the link between electricity and lightning by catching an electric charge in a lightning storm while flying a kite with a key tied to it. Based on this, he designed the lightning rod. Then, in 1879, Thomas Edison successfully created the electric lightbulb. Along with all this electricity came the issue of static. By the early 1900s, it was clear that people needed a way to block that static electricity so that their devices could work correctly and they would not be harmed or bothered. In 1918, Canadian-American engineer Roy A. Weagant created the first static eliminator. He designed his to get rid of the static interference people experienced when they made transatlantic wireless communications. This included the static electricity that clouded up the airwaves of those radioing to and from ships. This was especially important for those using radio systems and the like to communicate about military operations during World War I.
Thirty years later, in 1948, other engineers designed the first transistor. Ten years after that, engineers came out with the integrated circuit. As we inched closer to the digital age, static eliminators became more and more important. During the ‘50s, engineers conducted a number of tests to figure out how much electrostatic discharge/electrostatic charge (ESD) that devices of that time could take before losing quality. Based on these tests, they developed standards and testing methods for manufacturers to adhere to and use. Since then, the amount of electricity we use every day has skyrocketed. To combat the static that this electricity emits, engineers have created and continue to create even smaller and more sensitive anti-static technology. Those seeking to combat the effects of static electricity may employ two main types of solutions, active and passive. Active static control systems are those systems that require power in order to function. Passive control systems are those systems that reduce the surface static charge associated with static electricity by absorbing it. Of the two types, active static control solutions are far more effective because rather than just reducing the static electricity, they eliminate it. The most common active solution is ionization, or the formation of ions. Ionizing neutralizes an unbalanced charge and nullifies any particle attraction that would have led to the creation of more static electricity. Passive static control solutions include grounding and electrostatic induction. Grounding reduces static electricity by setting up a direct electric connection to the earth through which excess electrical charges can be discharged. The other main method of passive static electricity control, electro-static induction, works by placing a material or object with the capacity to develop the opposite electrical charge of the unbalanced item, within close proximity of said item. When they are close enough to each other, the static eliminator will develop a proportionate set of opposite ions and thus balance the unbalanced item. Ionizers achieve ionization through a variety of means, including via chemical reactions, electrical discharge, radiation, high temperatures, or particle collision. Static eliminating ionizers can be divided by whether they use an alternating current (AC) or a direct current (DC). AC ionizers have a large advantage over DC ionizers because of their inherent opposite polarity. DC ionizers can only acquire opposite polarity through the use of additional circuitry or power supplies. Anti-static bars, also called ionization bars, eliminate issues like static cling. Most often, users install anti-static bars above industrial product lines, where they send an ionized corona through the air to remove static electricity. Grounding straps are the most common type of grounding static eliminator. They are used in industrial manufacturing to ground equipment and machinery. Grounding wrist straps, or grounding bracelets, are worn by people working on or with very sensitive electronic equipment, as well as with those working around explosives. They prevent electrostatic discharge (ESD) by grounding workers and preventing the buildup of static electricity on their bodies. Static dissipative hoses are an ESD product made from grounding. With it, users can transport materials without fear of interference from static electricity in the air or hose. Anti-static brushes, sometimes called static brushes or ESD brushes, are a type of induction static eliminator. They let users clean items while eliminating existing static and not creating any additional static. 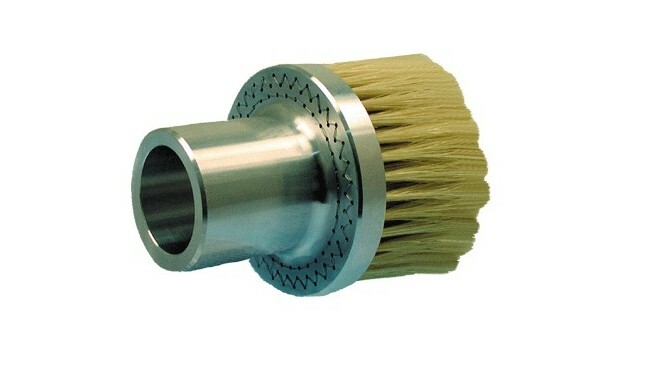 Most often, users use them for cleaning tasks like lead trimming, wiping, dirt removal, dusting, and solder removal. Anti-static bags, also known as static bags, also use induction to eliminate static electricity. To block static, users simply must place electronics, like computer chips, inside the bags. Anti-static mats are yet another induction static eliminator type. They discharge electric fields around workers. To use them, workers touch them before working on susceptible equipment. Anti-static flooring is conductive flooring that maintains conductivity regardless of environment. Most often, we see antistatic flooring in factories. Anti-static spray is an atypical mechanism of static elimination that works by coating surfaces with a thin, translucent layer of buildup-deterring spray. This spray is usually made from a soap-based material that has been diluted in a solvent like mild alcohol and, commonly, a flame retardant that works against the solvent’s flammable nature. They work well on surfaces with exceptionally high electric charges, in hard-to-reach places and blocked surfaces, and with products that move at high speeds. Anti-static gloves protect factory equipment, sensitive electronics, lab equipment, medical equipment, and the like from static electricity from a worker. To a degree, anti-static gloves also provide the worker with ESD protection. Corona treatment is another uncommon form of static control. In fact, it is actually more of a surface treatment that provides static control as a byproduct. The goal of corona treatment is to condition a surface to be more receptive to bonding with adhesives, inks, and other materials. By exposing surface material to an electrical discharge, called a corona, corona treaters both increase the surface’s bonding capabilities and protect it against static electricity buildup. Before performing a static elimination procedure or installing static eliminators, manufacturers must determine if their products or processes have been compromised by static electricity. To do so, manufacturers must test them with a static meter, such as an electrostatic field meter or an electrostatic voltmeter. After confirming that a product requires static elimination, suppliers will fight or neutralize it using one or more of the static eliminator types/ESD products available to them. The static eliminator safety and compliance standards your devices need to adhere to depend on your application, industry, and location. The NFPA, or National Fire Protection Association, for example, offers a wide range of standard guidelines that help guideline followers reduce the risk of fires and explosions. NFPA static eliminator standards work especially well for American operators of printing and coating applications. Other organizations in the United States that issue static eliminator standards include the military (Mil-Specs), the ESDA (Electrostatic Discharge Association), ANSI affiliate, the NRC (Us Nuclear Regulatory Committee), and the FDA (Food and Drug Administration). Also, the International Electrotechnical Commission (IEC) has been putting out standards related to electrostatic discharge for customers around the world since the 1980s. We highly recommend making sure that your supplier can make static control products that meet IEC standards before agreeing to work with them. For information on the best standard requirements for your application, talk to your industry leaders. The best way to get a static eliminator product that works well for you is by teaming up with an experienced and reliable static eliminator manufacturer. To help you connect with a high-quality supplier, we have put together a list of top-rated static eliminator manufacturers on this page. You will find it by scrolling up towards the middle of this page, where it is wedged in between these info paragraphs.  Before you begin browsing, we recommend you focus your search by creating a list of your own. This list should detail your specifications, requirements, questions, and concerns. Remember to include important aspects of your applications like budget, project timeframe, delivery preferences, and post-delivery support preferences (installation assistance, maintenance, etc.). Once you have put together your list, start browsing the static eliminator suppliers. From among them, pick three or four that show the most promise, based on your list. Then, reach out to each of them to discuss your application at length. After you have spoken with representatives from each company, compare and contrast your conversations. Who was able to offer you not only good prices, but good customer service? Determine which manufacturer is right for you and reach back out them to seal the deal.